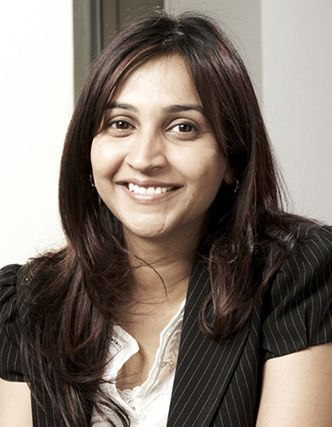 Deepa Mani, Assistant Professor and Joint Executive Director, and Shankadeep Banerjee, Research Associate at ISB’s Srini Raju Centre for IT and the Networked Economy (SRITNE) have developed a Smart Cities Maturity Model (SCMM) that will help Indian cities to assess where they currently are on their journey to being smart cities and decide how they want to align their strategic priorities and resources. In India, urbanisation is a rapidly growing trend fuelled by the government’s emphasis on the manufacturing and services sectors as engines of growth and the transition thereof to these sectors from agriculture. As per the 2011 census report, more than 600 million Indians will be living in urban areas by 2031, and the contribution of urban India to her GDP is expected to rise from 52% in 2011 to 75% in 2031. Yet, the current state of infrastructure, human capital and services in Indian cities is an important constraint in accommodating the pace of urbanisation. A plan for rapid development of 100 smart cities by the Government of India intends to address this challenge. A smart city is commonly defined as one that leverages technology to integrate and optimise its limited resources towards better habitability, sustainability and citizen empowerment. But there is limited understanding of how technology-enabled solution(s) will help a city evolve into safe, secure, and efficient urban cities. After all, one solution would not fit all regions. In response to the need for a tool for benchmarking and effective design of smart cities, we have designed a framework, the Smart City Maturity Model (SCMM), which helps a region (city or state) assess its technology readiness in absolute and relative terms, and consequently, implement a solution that is uniquely aligned with its resources and capabilities. SCMM will help governments grow and expand their cities as urban centres by identifying technologies, processes and enabling policies that help the cities deliver citizen services in a reliable, sustainable and efficient manner. Based on the state of their physical and social infrastructure, Indian states can be categorised into four clusters of development – development laggards, low moderate development, high moderate development and development leaders. 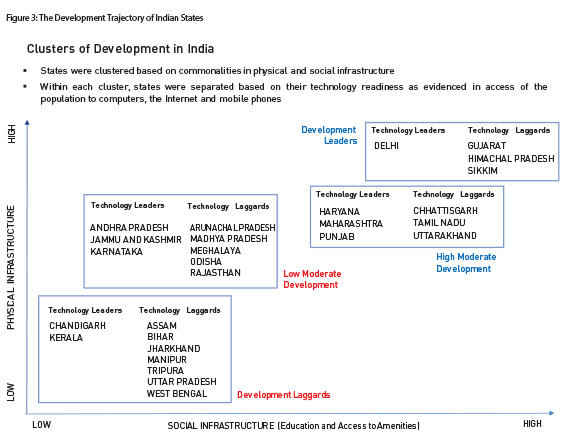 Within each cluster of development, states that are technology leaders (based on citizen usage of computers, mobile and Internet) – Delhi, Haryana, Maharashtra, Punjab, Andhra Pradesh, Karnataka, Chandigarh and Kerala – enjoyed significantly greater per capita GDP, innovation and quality of life than technology laggards. For maximal benefits, the smart city solution must be aligned with the physical and social infrastructure of the city as well as its technology readiness. Our case analysis reveals five smart city solutions – information dissemination, services optimisation, services replication, services integration and connected services. The first two solutions are best suited to cities which have been identified as developmental laggards or low moderate development while the latter three are aligned with cities which have been identified as high moderate development or development leaders. More mature smart city solutions involve significant change management effort, including incentives for stakeholder involvement, process and structural redesign and coordination amongst several key agencies in the government. The SCMM Framework (Figure 1) broadly consists of two parts – an Assessment Framework and a Solution Framework. The Assessment Framework helps a city or state assess the condition of its social, physical and technological development to identify its readiness for implementation of smart city solutions. The Solution Framework helps the city design a smart city solution that is uniquely aligned with its state of development or smart city readiness. The smart city solution may be characterised in terms of its operating model, technology and process design, and the extent of stakeholder involvement in the solution. The Assessment Framework positions a city on a development trajectory based on the state of its physical and social infrastructure. In the current study, we assess these development parameters using 2011 Census data. Factor analyses of the indicators detailed in Figure 2 reveals three second-order factors – education levels, access to amenities and infrastructure. Our choice of these parameters is driven by the findings of a rich body of work that technology-enabled smart city solutions are supported by both the physical infrastructure of the city as well as the motivation and ability of its people to leverage such solutions. Cluster analysis of the development parameters revealsfour groups of Indian states – laggards, low moderate development, high moderate development and leaders (Figure 3). Laggards score low on all development parameters while leaders score high on all parameters. Low moderates are close to laggards in terms of social infrastructure but have superior physical infrastructure. High moderates score the same as leaders on social infrastructure indicators but lag behind in physical infrastructure. There is a significant gap between low and high moderates on all parameters of social and physical infrastructure. Based on the state of their physical and social infrastructure, Indian states can be categorised into four clusters of development – development laggards, low moderate development, high moderate development and development leaders.Our case analysis reveals five smart city solutions – information dissemination, services optimisation, services replication, services integration and connected services. Information and communication technologies (ICT) are at the heart of smart city solutions. Indeed, a first step towards implementing smart cities is ensuring the latter’s technology readiness through the establishment of appropriate digital infrastructure. Therefore, as a next step, within each cluster of development, we separated states by their technology readiness in terms of access to modern technologies like computers, Internet and the mobile phone. A comparison of the economic performance of technology leaders and laggards within each development cluster provides preliminary evidence of the performance impact of smartness of cities. 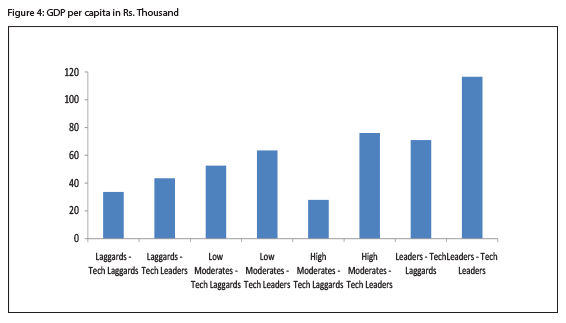 As shown in Figure 3, within each cluster of development, states characterised as technology leaders systematically outperformed the technology laggards. The results emphasise the important role played by digital infrastructure in states for their economic and social development. Such assessment of the digital infrastructure of an area is also necessary prelude to the implementation of smart city solutions. As we note in the solution framework, the smart city solution must be uniquely aligned with the social and infrastructural development of the state to realise maximal benefits. 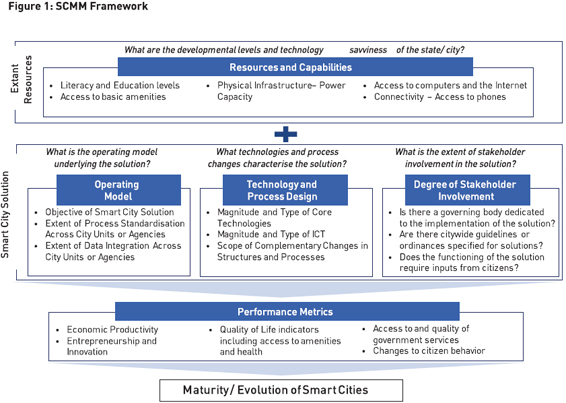 The Solution Framework also details the defining characteristics of and challenges in implementation of smart city solutions at each level of the maturity curve. These characteristics are based on an extensive review of the Information Systems (IS) literature on large-scale technology adoption and implementations. The scope of the solution increases along the maturity curve from autonomous applications with limited stakeholder involvement to integrative applications characterised by high levels of interdependence and coordination amongst stakeholders. The Solution Framework maps a smart city solution to the state of development of the focal area. 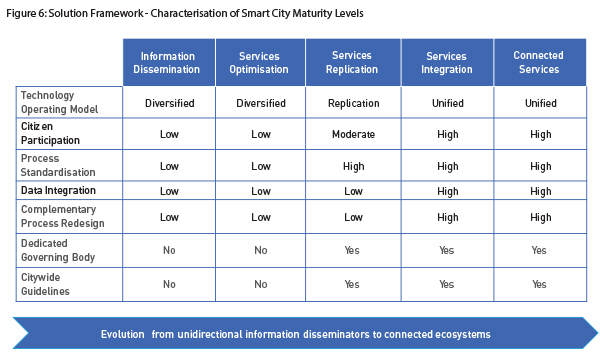 Based on an extensive review of 25 smart city solutions worldwide, we identify five stages of the smart city maturity curve – Information Dissemination, Services Optimisation, Services Replication, Services Integration and Connected Services. These five stages and the points on the development trajectory that they map to are outlined in Figure 5 below. 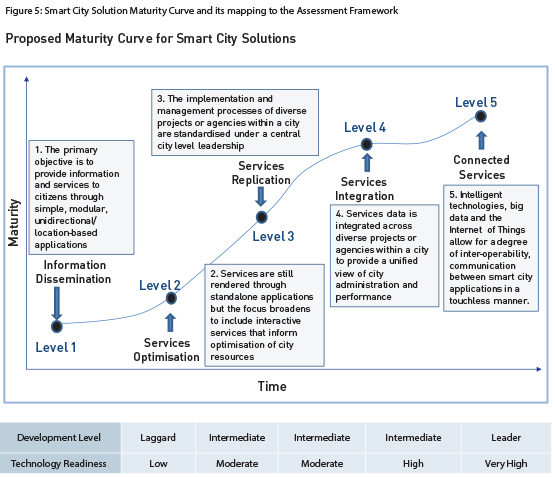 The Solution Framework also details the defining characteristics of and challenges in implementation of smart city solutions at each level of the maturity curve. These characteristics are based on an extensive review of the Information Systems (IS) literature on large-scale technology adoption and implementations. The scope of the solution increases along the maturity curve from autonomous applications with limited stakeholder involvement to integrative applications characterised by high levels of interdependence and coordination amongst stakeholders. The allied operating model too progresses from being diversified with low levels of process standardisation and data integration to being unified with high levels of process standardisation and data integration. In turn, the change management effort that complements the technology solution also increases along the continuum with services replication, integration and connectedness requiring high levels of structural and process redesign, incentives for user adoption, and coordination and integration of effort amongst stakeholders. The attributes of each of the smart city solutions, including operating model, process standardisation, data integration, citizen participation, and complementary change management effort is detailed in Figure 6. Our research suggests that all these parameters must be addressed in tandem for the smart city solution to deliver the intended impact on quality of citizen services. The Solution Framework described above may also be extended to the implementation of a specific technology solution within a city or state. 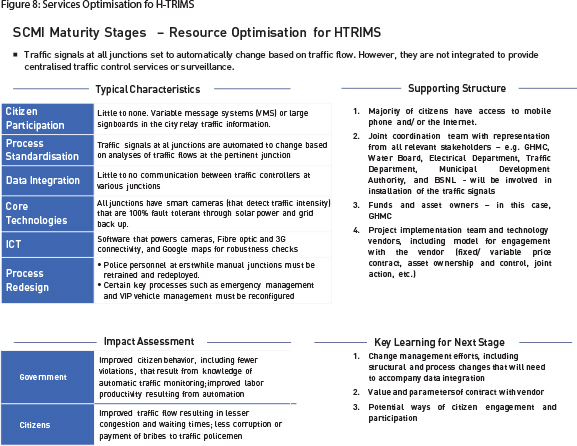 For example, consider the implementation of Hyderabad Traffic Integrated Management Systems (H-TRIMS), Hyderabad Traffic Police’s replacement of their 20-year old traffic management system comprising standalone, manually operated signals. H-TRIMS are integrated traffic management service spanning 221 signals in the city, which are automated and centrally controlled by a Traffic Command Centre. Monitoring of traffic congestion, redirection of traffic flows through variable message boards, and synchronised signalling and corridor management are all coordinated across the city by a central command and control system. The system is supported by a back-up power management solution to provide non-stop connectivity as well as a central MIS solution for the management of emergency situations like terrorist attacks, accidents, VVIP movements, etc. Below, we illustrate how our Solution Framework can also be applied to this specific technology solution implementation in a state or city. Specifically, we detail various techniques of implementation of H-TRIMS that align with the state of development of a city as identified by the assessment framework. SRITNE’s Smart City Maturity Model (SCMM) represents a preliminary effort to develop a framework that will help cities design technology-enabled urban development solutions that are uniquely aligned with their resources and capabilities. The development trajectory delineated in the current study is more illustrative of parameters that can be used to assess the “smartness” or readiness of cities for technology enabled solutions. 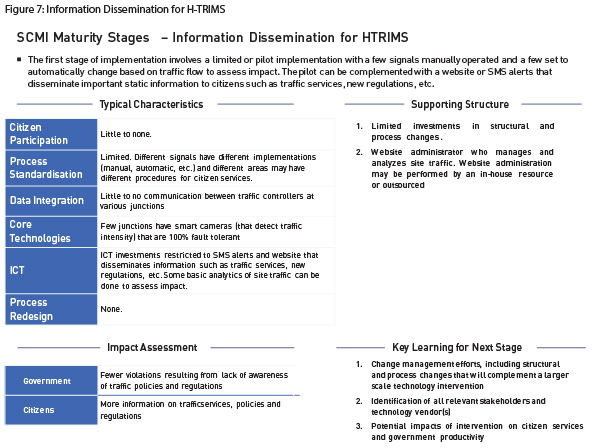 In the case of H-TRIMS (Figure 7), a solution that focuses on information dissemination alone would involve a limited or pilot implementation with a few signals that are manually operated and a few that are set to automatically change based on traffic flow. The pilot implementation may be complemented with a website or SMS alerts that disseminate important static information to citizens such as traffic services, new regulations, etc. A solution that focuses on services optimisation is also suited to regions with low to low-moderate level of development and technology readiness. In the context of H-TRIMS (Figure 8), such a solution would involve traffic signals at all junctions to be set to automatically change based on traffic flow. Based on the digital infrastructure of the state, cameras at traffic signals could be set up to automatically detect violations or other incidents and send alerts to the relevant authorities and citizens. However, these signals may not be integrated to provide centralised traffic control services or surveillance. The third and fourth stages of SCMM solution framework are more suitable for regions with high moderate levels of development and fairly sophisticated digital infrastructure as this solution involves enhanced services replication and integration. What this would mean for H-TRIMS (details in Figure 9) is that all signals are set to automatically change based on traffic flow. The data from these signals, including videos, are integrated and owned by a central or unified command and control centre. Integrated data, in turn, allows for automation of citizen interactions, greater citizen participation and improved productivity of the traffic police. 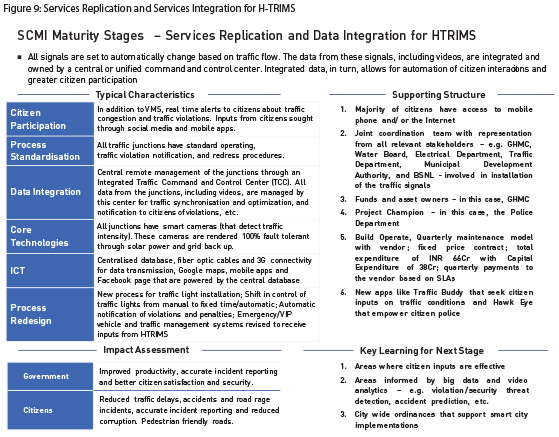 The current vision and implementation of H-TRIMS is representative of the Services Replication and Services Integration phase of the Solution Framework. Data on individual violations and transgressions can be linked to Aadhaar-enabled bank accounts to solicit penalty payments on user log in. The central command and control centre can send real time alerts on major incidents or violations to ground staff for better law enforcement, and reduction of accidents as well as corruption. Traffic data at all junctions can be made available to various empanelled agencies such as emergency vehicle management systems and crime desks so they can take appropriate effective actions. Rendering the traffic data open can empower citizens to develop value added applications which not only represent increased innovation and entrepreneurial activity but also help the government in better service delivery. Investments in smart data warehouses and big data analytics help detect patterns and anomalies (reckless driving, etc.) that can, in turn, be used to predict accidents or criminal activity and proactively alert the relevant authorities. As all cities begin to implement such solutions, the underlying data can be shared across cities to track suspicious vehicles through standardised image processing of vehicle attributes (like registration number, color, make, etc). Additional sensors for tracking air pollution, etc. can be installed in the area and connected to the smart traffic lights so that the latter become conduits/ channels for dissemination of sensor data. Smart traffic lights data can be integrated into intelligent, self-driven transport vehicles. SRITNE’s Smart City Maturity Model (SCMM) represents a preliminary effort to develop a framework that will help cities design technology-enabled urban development solutions that are uniquely aligned with their resources and capabilities. The development trajectory delineated in the current study is more illustrative of parameters that can be used to assess the “smartness” or readiness of cities for technology-enabled solutions. We are currently engaged in collating archival data at the district level to estimate a development trajectory for Indian cities. Similarly, we are working with a set of technology providers to obtain a more granular characterisation of each of the maturity levels. Notwithstanding these limitations of the current framework, the SCMM represents a robust urban planning tool that would be an asset for the central and state governments in order to achieve their smart city ambitions. We thank Reema Gupta at SRITNE for research assistance. We also thank IBM for valuable insights on smart city implementations worldwide and Yadavalli Subrahmanyam for valuable insights on the H-TRIMS project. A detailed report on the Smart City Maturity Model is available on the SRITNE website. 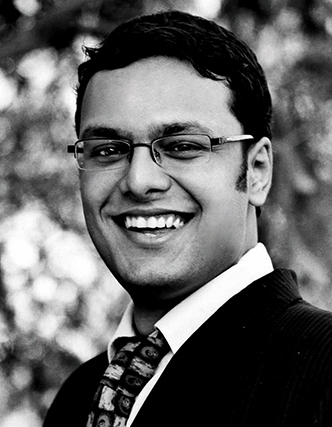 Doctoral student of Management Information Systems at the Indian Institute of Management, Calcutta.